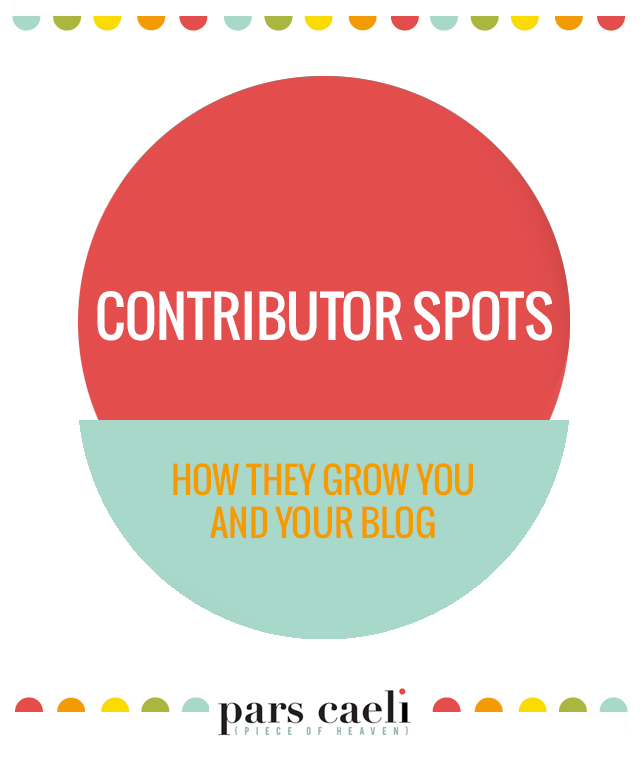 If you're a blogger or a maker or a writer, you've likely considered the idea of contributing to another website or blog. There are lots of reasons you might throw your hat in the ring as a contributor: for greater exposure, for compensation, for a connection to creatives you admire. There are other reasons you might decide contributing is not for you: your content under someone else's brand, more work/more timelines, or an imperfect fit of your content with another blog's message. Pars Caeli is in its second year and is growing steadily from a tiny blog to a flourishing blog. In year two, I've been focusing on two goals for this webhome: cover-expenses revenue and growth. With a DIY/project based blog, I have expenses on materials and hosting, and I need Pars Caeli to be moving me into the black instead of the red, and we're making positive growth in that direction. I also want to grow this year...Grow in a broad sense. Of course, I'd like to reach more readers and become a daily read for more people, but I also want to stretch into new territories and try out some new adventures as a part of this blogging journey. I decided to follow my heart, as I almost always do, and make some inquiries at blogs that I love. With gazillions of fantastic blogs (and bloggers) out there, it was tough to narrow down. I considered whose content I continually found interesting and whose content resonated with my own. Many contributors go for freelancing in an arena outside of their blog content, and I decided I wanted an even deeper dive into kid projects, parenting, and DIY. Earlier this year, I became a monthly contributor to Classic Play, an incredible creative site run by Jen Cooper. I've been following Jen for quite a while now (she taught me how to find my voice in an Alt Summit class long time ago), and I even have the pleasure of calling her a friend. Parenting is fun over at Classic Play, and loving your children and dedicating time to be with them is strongly encouraged - and I wanted to be a part of it! Contributing to Classic Play is about networking and reaching a new audience, but I'm there more because I'm really enthusiastic about the mission of positive parenting and creative households. I love seeing my work mingled with Jen's and the other amazing contributors. I'm super excited to announce that I'm a brand new collaborator on another blog that I've admired, Modern Parents Messy Kids. 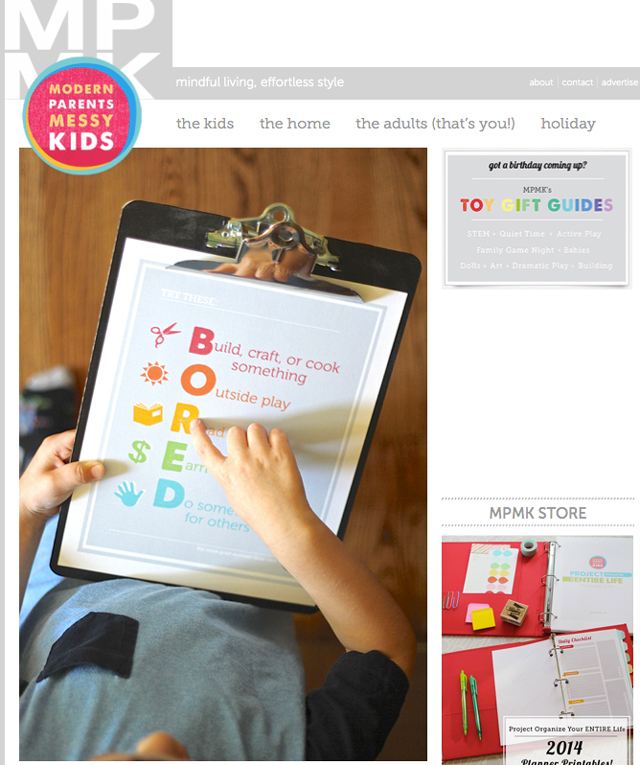 Steph's motto over at Modern Parents Messy Kids is "mindful living, effortless style". Her energy and clear vision for a beautiful life are contagious, and as a fellow mom of three, she knows what it means to have a lot on your plate. Steph's letting me utilize some of my design muscles to create some fantastic printables for her readers. With more than 100K Pinterest followers, Steph's posts reach far into an audience I love - busy, awesome moms. As a contributor to MPMK, I also have the opportunity to pin my other projects here on Pars Caeli to the contributor's board, which is an amazing gift! Contributing is not for everyone, and it may not always be for me. As I grow as a creator and writer, it feels like the right time. If you're looking to contribute as a large source of income or to gain significant followers, you might want to reconsider. Not all sites link back to yours (and if they do, readers are not very likely to follow the author link), and it is the engaging content that you create that brings in the views, not (typically) your authorship alone at the small-to-medium size blog. You'll still find me here, in my home, Pars Caeli, three days a week (as long as our internet connection stays consistent!). I have unique projects and ideas I want to share with you here. I hope you'll take some adventures with me to these other sights, too! Your readership means the world to me, and I love seeing how you bring some of these pieces of heaven into your life.